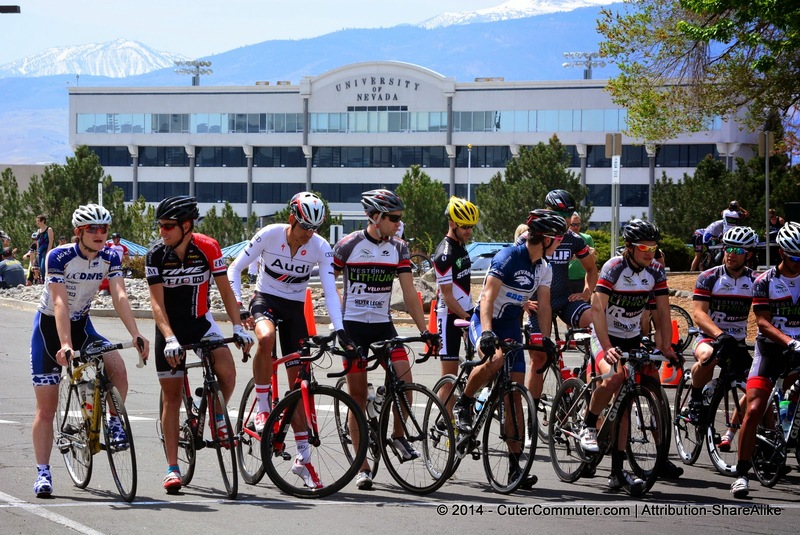 On Saturday my husband John and I drove to the University of Reno for criterium road bike races in which competed. Normally I would pedal on my bike to campus. But since we were headed to the same location and he was driving our car to carry his bike and the gear he needed for the event, it was a good use of our car's resource to carry me and my bike also. In the interest of competition, the Cat 1/2 was combined with the Cat 3/4/5 since John's field (group) was so small. 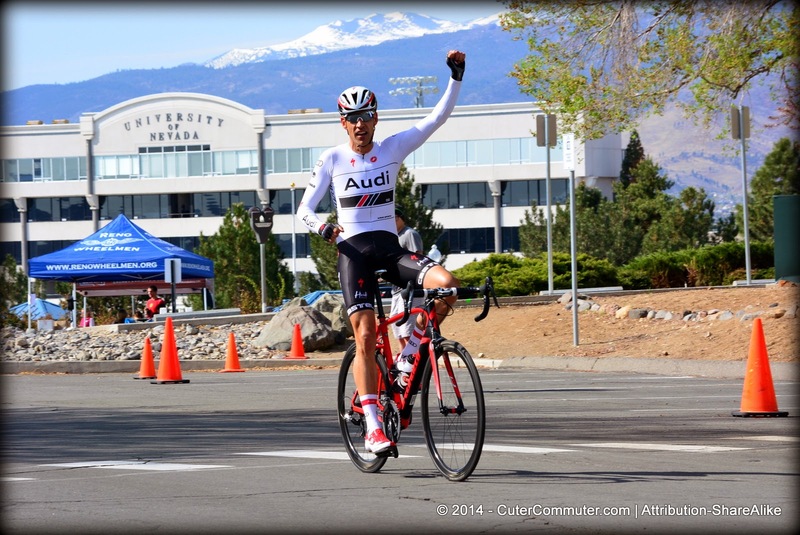 John won the Master's 35+ 1/2/3/4/5 and rode solo across the finish line. After John's first race, I rode down to the Reno Bike Project on 4th Street downtown. A team of us were assigned specific routes along neighborhoods in the Old Southwest. Then we split up in pairs and rode our bicycles down the tree-lined streets where we distributed door hangers to the community. The message to our neighbors was that we are collecting bicycles and parts so that they can be refurbished and recirculated back into our community. We hope they will consider donating any unused bicycles or parts they may have and we will pick up any of those items left outside on the front door at a scheduled date and time. When we had the opportunity to speak with the local residents, they gave us very positive feedback for our cause and they wished us luck!! 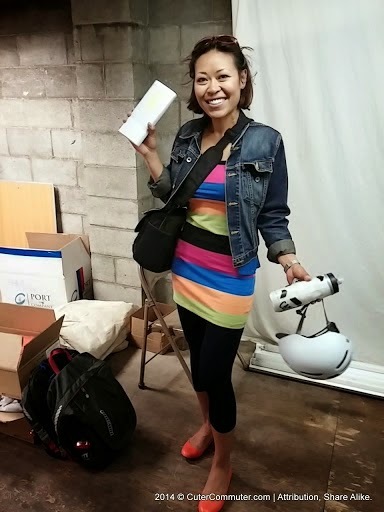 This is one of the reasons why I enjoy being a Board Member of the Reno Bike Project. Because I get to help make a difference in our community and have fun in the process!! When we ran out of door hangers, our job was over. Then it was time for me to head back to the UNR campus and catch John's second race. Road bike criterium racers line up at the start line. 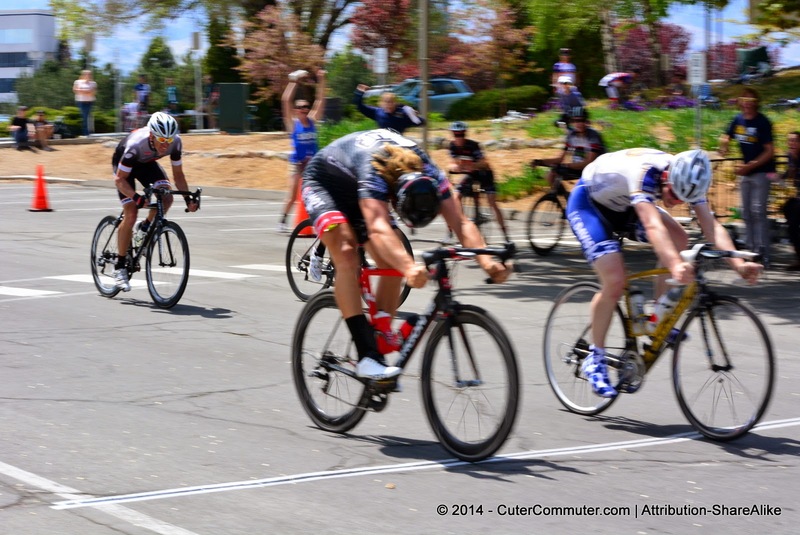 If you have ever watched a Pro 1/2 Category criterium race, you know how exciting it can be. The sound of the wheels rolling on the pavement as the racers fly by sounds like standing near a gushing waterfall!! Criteriums are very technical and requires really good bike handling skills through downhill turns and zig-zagging chicanes. 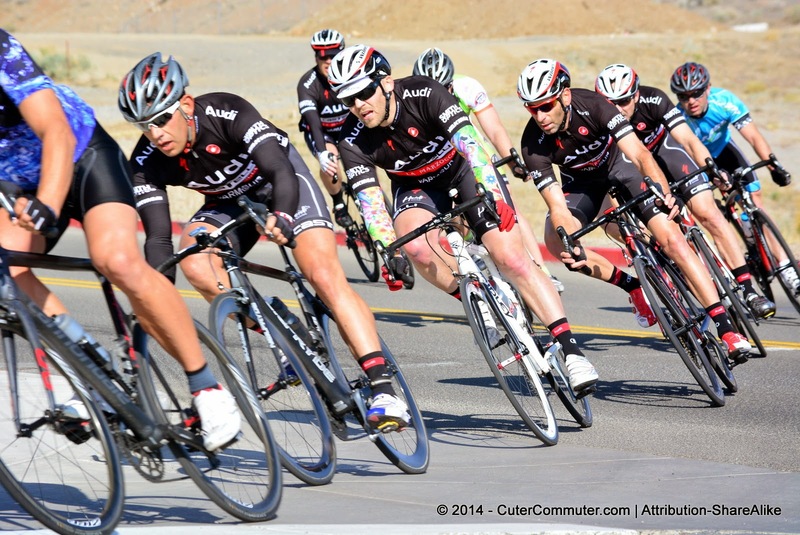 Road race criteriums are technical and require good bike handling skills. There was a sprint for the finish and John crossed the line in 5th place. Prizes were awarded to top finishers of each race category and John made out like a bandit!! So after the race John and I went to Buenos Grill at Mayberry Landing to have lunch. 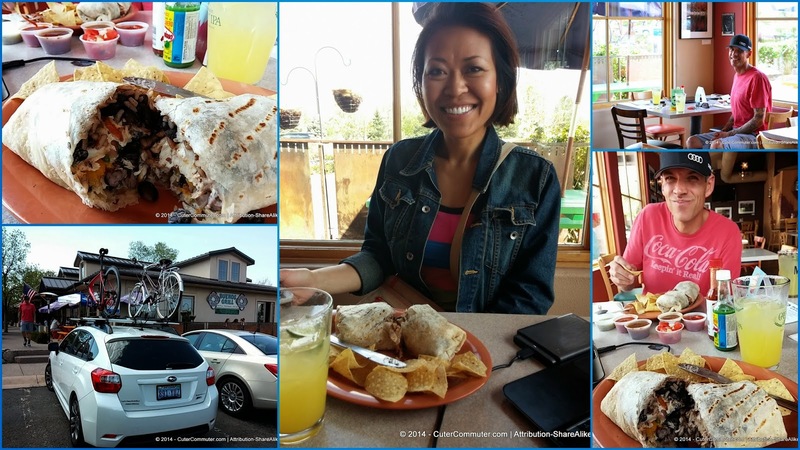 We devoured the Buenos Burrito (charbroiled fish with mango salsa and citrus honey butter) and the Del Mar Burrito (spiced rubbed salmon with sour cream chili sauce) and sipped one of THE most delicious Margaritas!!! With John's parents in town for work related to their leather making business (Western Star Leather), we went home to enjoy each other's company and the dinner we cooked together. 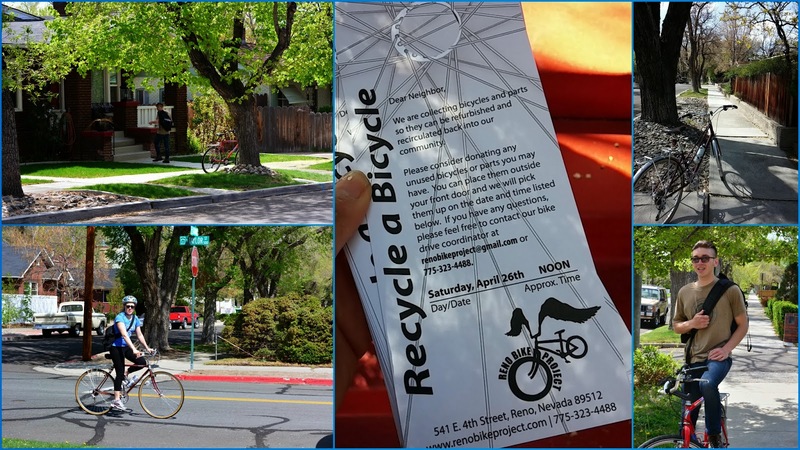 View more photos from the Reno Bike Project Door Hanger for Bikes Drive and the UNR Campus Criterium web album.